DEAD SEA, Jordan (CNS) — Arab Christians voiced hope and concern over U.S. President Donald Trump’s first foreign visit and his speech in Saudi Arabia to the Muslim world, in which he urged a peace-focused Islam as a counter movement to extremism. “I hope that President Trump will remind us that we have to think about youth and the future of the Middle East and its countries,” Chaldean Catholic Archbishop Yousif Mirkis of Kirkuk, Iraq, told Catholic News Service. He spoke on the sidelines of the World Economic Forum meeting on the Jordanian shores of the Dead Sea May 19-21 as Trump traveled to neighboring Saudi Arabia. Youth make up the majority of most Middle Eastern countries, and they face a bleak socio-economic future, with youth unemployment hovering around 30 percent. Archbishop Mirkis cited it as one of the drivers laying the groundwork for extremist violence — frustration over little socio-economic prospects. “Differences are a part of our culture. We cannot resolve the problem of differences, but dealing with these differences in a meaningful way can make our lives more peaceful, like here in Jordan,” he said, also pointing to the region’s rich mosaic of ethnic and religious diversity. Over the past three years, his parishes have aided some 500,000 Iraqi Christian and other religious minorities fleeing persecution of so-called Islamic State and sectarian violence that has engulfed Mosul and the Ninevah Plain. He said Iraq has been on the front line of the Islamist extremism and terror that has become “very dangerous for the world.” Yet he expressed hope for reconciliation to prevail in his war-torn homeland. “We are so happy to see so many people from different countries here,” he said. “They are together like brothers and sisters. We can and want to do that in Syria and Iraq,” Archbishop Mirkis said. A high-profile speech by Trump from the home of Islam’s two holiest sites urged Muslim unity with the U.S. to fight Islamist militants and terrorism. “If we do not stand in uniform condemnation of this killing, then not only will we be judged by our people, not only will we be judged by history, we will be judged by God,” he said, addressing 55 leaders from predominantly Muslim countries gathered in the Saudi capital, Riyadh. “It means standing together against the murder of innocent Muslims, the oppression of women, the persecution of Jews, and the slaughter of Christians. Religious leaders must make this absolutely clear — barbarism will deliver you no glory. … And political leaders must speak out to affirm the same idea. Heroes don’t kill innocents; they save them,” he added. Trump’s speech attempted to set the U.S. and himself on new footing with the 1.6 billion Muslims worldwide after he frequently criticized Muslims on the campaign trail last year and tried to ban many from entering the United States. Father Rafic Greiche, spokesman for the Egyptian bishops, welcomed Trump’s remarks, calling them “very, very frank,” especially in light of several recent bombings, beheadings and other attacks claimed by the so-called Islamic State on Egyptian Christians and churches. “It’s not a normal political speech. The Muslim leaders had to hear these words at last, especially when he said, ‘You have to get the terrorists out,'” the priest told Catholic News Service by phone from Cairo. “This struck me most because there were leaders sitting in the meeting from countries that patronize terrorists or give them support,” he said, underscoring the frustration and vulnerability many Egyptian Christians feel in the wake of deadly terror attacks. However, Father Greiche said he believes Trump and Egyptian President Abdel-Fattah el-Sissi share similar views on confronting the menace. In their speeches at the Arab Islamic American Summit, both Trump and Saudi King Salman rebuked the Sunni Muslim kingdom’s regional rival, Shiite-majority Iran, as a terror backer. The U.S. president called on the Muslim world to help isolate Iran. 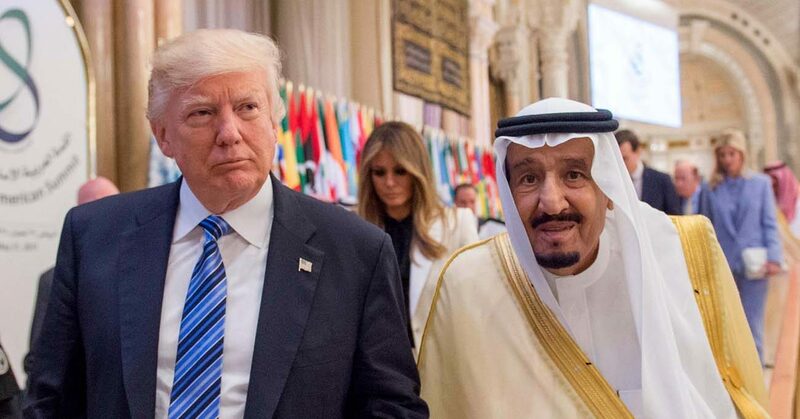 But Arab Christian businessman Michael Morcos, commenting on Trump’s visit, saw a “marriage of convenience” between Washington and Riyadh over their $110 billion arms deal, which preceded the speeches. Morcos said the renewed partnership can endanger the overall peace in the Middle East. Saudi Arabia and Iran are already engaged in proxy wars in Syria, Yemen and Iraq to destructive effect. “The Sunni and Shiite parts of the Arab world are separating, and the gap is becoming wider. I think Trump’s actions will widen the gap,” Morcos said. Some analysts believe that by making lucrative arms deals with Saudi Arabia, Washington will find it hard to pressure Riyadh to reform its own brand of fundamentalist Islam, known as Wahhabism. In 2013, the European Parliament published a report citing Wahhabism as a main cause of global terrorism. Chemi Peres, chairman of the Peres Center for Peace, spoke to CNS on the sidelines of the World Economic Forum ahead of Trump’s second stop in Jerusalem.